Authorities in the southern Chinese province of Guangdong have released on "bail" a rights activist who publicly commemorated the June 4, 1989 military crackdown on the Tiananmen Square student movement last year. Li Xiaoling was charged with "picking quarrels and stirring up trouble," after she wore a T-shirt with a commemorative slogan on Tiananmen Square last year. 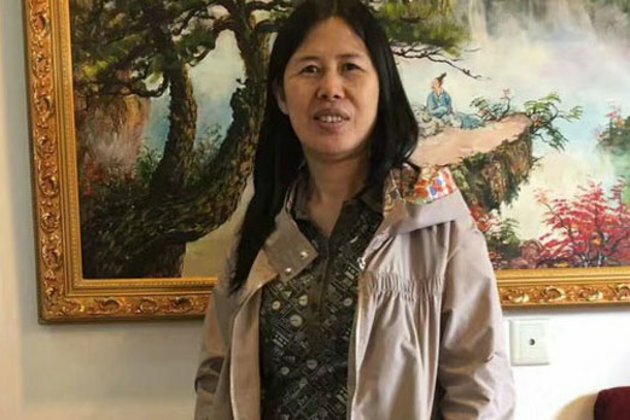 Li was released from the Xicheng Detention Center in Guangdong's Zhuhai city, she confirmed in a brief exchange on Tuesday. But she declined to comment further. "I'm in Zhuhai, but it's really not convenient for me to talk right now," Li said, using a phrase often used by activists to indicate the presence of surveillance. Li's friend Zhou Li said she is still under considerable police restrictions. "It is inconvenient to contact her right now, because she signed an agreement to a bunch of restrictions on her when she came out," Zhou said. "Her relatives work [in Zhuhai], so it may not be convenient for her to give interviews." The T-shirts bore the words "June 4th. Never Forget," and state security police quickly launched a probe into the photographs. Li suffers from severe glaucoma, a condition that worsened during her detention, and she only received over-the-counter eye drops to relieve her symptoms. She is now nearly blind in her left eye, Zhou said. "I am very happy that she is back," she said. "Her mood is relatively good, but her health is very poor." Zhou added: "Besides her eyes, she has been in pain from a tumor in her abdomen, but we don't know if it is benign or malignant." Li's former defense lawyer Lin Qilei said her release came after previous requests for bail were rejected by the authorities, and may have been as a result of Li's agreeing to fire him as her attorney. "The authorities are of the view that her original lawyer wouldn't do as he was told, and wouldn't allow himself to be manipulated by them," Lin said. "Once she had fired her original lawyer, the two sides came to a compromise arrangement that allowed her to be freed earlier today." "This is the sort of pressure the authorities put on people, by promising them a suspended sentence or [other concessions] if they get rid of their attorney," he said. "If they keep using that lawyer, they will probably get a much heavier sentence." "Giving the fact that Li Xiaoling's eyes are in urgent need of medical treatment, it's entirely understandable that she would fire us, and we have no complaints about that," he said. The number of people who died when People's Liberation Army (PLA) troops cleared Beijing of thousands of protesters calling for democracy who had camped for weeks in on Tiananmen Square remains a mystery, and the ruling Chinese Communist Party clamps down quickly on any public commemorative activities. However, younger people in China continue to bypass the "Great Firewall" of Internet censorship to find out about the events of 1989, activists told RFA at the time of Li's detention. The Tiananmen massacre was preceded by a peaceful gatherings of students, workers, and others in Beijing's Tiananmen Square and other cities in April 1989 calling for freedom of expression, accountability, and an end to corruption, but the government responded by instituting martial law, the New York-based Human Rights Watch said in a report issued on last year's anniversary. Victims' group the Tiananmen Mothers have compiled exact accounts of the deaths of 202 people across China, including Beijing.